There are two kinds of people in the world - those who love self-help books and those who make fun of self-help books. I belong to the first kind and self-help is one of my favourite aisles in a bookstore. Just like how we keep our physical bodies fit by eating right and exercising everyday, I believe we need to invest time towards our mind and emotions on a daily basis. Reading self-help books are one of the many ways by which we could reflect on our days and lives. Sometime in 2003, I read Shiv Khera’s popular book “You can win”. I don’t remember much of it now, but I liked it for its simplicity and powerful quotes. In his new book “You can achieve more - Live by Design, not by default", the author follows a similar writing style, but focusing on more important aspects that are relevant for today. If “winning” is all about goal setting, preparation and time management, “achieving” involves a lot more to do with our mind. The author touches upon most important aspects such as creating a positive attitude, watching our thought patterns, cultivating a high self-esteem, importance of self-discipline, overcoming self-imposed limitations etc. He explains each of these aspects through interesting anecdotes from his personal experiences as well as popular stories. Each chapter ends with 3-4 questions to reflect on where we stand and journal about how we could improve. 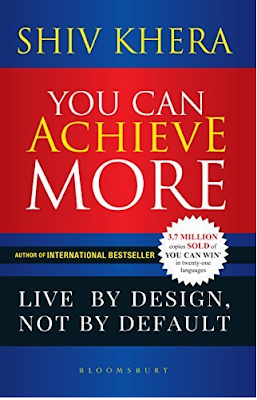 What I loved the most about this book is that the author has included the importance of values, ethics, integrity and character in a book on “achieving more”. On the contrary, what we see in the real world today is people giving up on their values, losing integrity and spoiling their character, all for the sake of “achievement” as defined by the society. The example I keep repeating in my blog often is that of food bloggers shamelessly promoting junk foods in their social media posts, just so that they can earn extra bucks for their holiday abroad. The only area where this book is lacking is a structure or a flow to showcase how the content is presented. Many relevant topics are covered, but they don’t seem to be linked in a logical flow. So at the end of the book, it is hard to recollect a path or a framework to associate the topics. Leaving that aside, it is a relevant read for all of us in the present context. It is imperative we take a deep look at ourselves to reflect on areas that are important to our growth and to build a life of excellence.